Tilia Klebenov Jacobs: Don’t write what you know. Write what you love. I’m welcoming a wonderful guest to the blog today: Tilia Klebenov Jacobs. 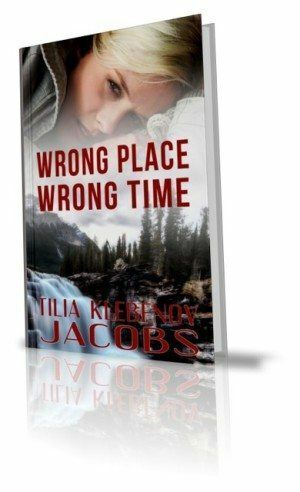 Tilia is the author of Wrong Place, Wrong Time and has so kindly prepared a guest post and shared an excerpt! Don’t write what you know. Write what you love. I am the sort of person who lines up her ducks before doing anything rash, duck-wise; but in this case it was not an option. Which turned out to be a gift in disguise. I wrote my novel for National Novel Writing Month, affectionately known as NaNoWriMo, an annual challenge to write 50,000 words of fiction in November. 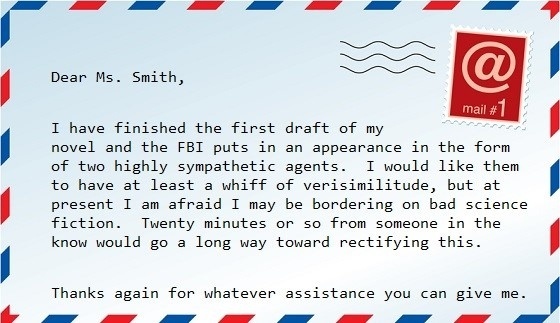 In October I outlined, created character bios, and researched what I could; but I did not have any FBI agents on tap. So I called the FBI office in Boston, where I live. They gave me an email address for FBI Headquarters in Washington. I wrote immediately. 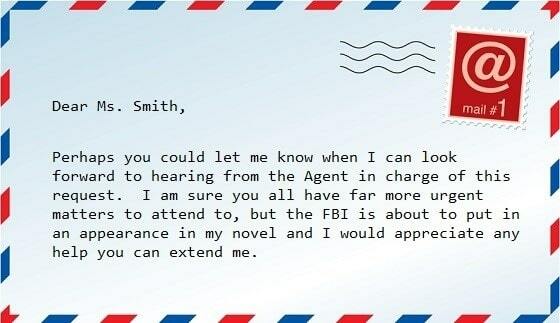 I received a reply from a lady whose name is not really Ms. Smith, assuring me that a suitable agent would contact me. When this never happened, I emailed again. She replied that the agent she had lined up for me was busy investigating a mass murder. As excuses go, I thought that was pretty good; so I assured her I could wait. Meanwhile, November was underway and I was making an exhilarating discovery: write first, ask questions later. Regardless of my ignorance, NaNoWriMo dictated that I keep writing. Otherwise I would fall behind in my word count, and quite probably lose the contest. If someone calls you saying his sister’s been kidnapped, how do you respond? As I wrote, however, I realized I had oodles more questions. My list grew with every plot development. I now had a much clearer idea of what I needed to ask. Bonus! On the downside, I still hadn’t heard from the elusive agent, and my wild stabs in the dark as to crime scene procedures were becoming increasingly comical. I emailed again. The response was a polite reassurance that another agent would contact me. While he didn’t, I kept writing. Finally, one shiny winter day, I completed my first draft. It was a splendid example of what NaNoWriMo founder Chris Baty calls “exuberant mediocrity.” Oh, it was lousy, all right—but it was mine, my hideous and wrinkly newborn I could now mold into greatness. I hoped. I emailed Washington one last time. Ten minutes later the phone rang. It was Ms. Smith. She had lined up two agents who would be delighted to talk to me. Would Tuesday be all right? It would. The agents were extraordinarily generous with their time and expertise, and lavished my manuscript with such a bounty of data that it blossomed like algae in a heat wave. For this and for the fact that the gentlemen refrained from laughing out loud at my depthless ignorance, I am forever grateful. How long does the phone call take? When s/he transfers the call, who takes it? What was the name of that office again? How long does it take them to get to my fictional New Hampshire town? What should Court do in the meantime? How much does the FBI communicate with the family of the hostage? For example, would they say they knew who the kidnapper was, what they knew about him, and what he wanted? How much would they attempt to reassure the family? What is the overall psychological approach? They can’t trace license plates; the woman was abducted on horseback. So how do you trace the horses? You have a protocol for that? SWAT medics. Well, I never. See what I mean? Before I wrote that first joyful, flawed manuscript, I didn’t know what it was that I needed to know. If I had chased down all my information before starting, I wouldn’t have known where to stop. I’d still be researching. But given that my November 30th deadline was as warm and yielding as the granite cliffs of New Hampshire where much of my story takes place, I was forced to embrace a new dynamic. Ignorance was the rocket fuel of my first draft, and I uncovered crucial blank spots by creating the story. Ultimately, it worked great. So do as I learned to do. Just write. Write what you love. You can always fix it later. Court sat on the floor, leaning against the doorframe of the French windows in Tsara’s room. He was alone. Alicia and the boys were gone, had walked back to the main terrace and into the house on his orders. Tsara’s phone was in his back pocket, and he shifted it with one finger so he could sit more comfortably. He didn’t want to look into the room any more. He wouldn’t look. He had described everything he could see to the FBI, and the phone call spattered through his mind as he wondered if he had left anything out. The entire house was a crime scene, they said. He needed to preserve it. No one must touch the bedroom until the evidence response team got there. No one must leave or enter the house. The kidnappers might be watching. He must not alert the media. So Court had tried to remain calm. He had hung up and turned to Alicia, who stood on the terrace clutching her hands together. He wouldn’t let her in. He wouldn’t let Zachary or Zander in. During the phone call the boys had rubbernecked like motorists at a crash, standing on tiptoe to peer into the room. A couple of times they stopped and looked at each other. Court wondered if they were scared. But he didn’t care how they felt. He gave the three of them the instructions he had just received. “And if you do anything different it’s a federal crime,” he said. He didn’t know if that was true, but it sounded good; and if it made the Thornlockes sick with worry, well, that was something they all had in common now. Then he sank to the floor of the threshold, his back against the doorway to the lakeside terrace outside Tsara’s room, and waited. Tilia Klebenov Jacobs holds a BA from Oberlin College, where she double-majored in Religion and English with a concentration in Creative Writing. Following an interregnum as an outdoor educator with the Fairfax County Park Authority in Virginia, she earned a Master of Theological Studies from Harvard Divinity School and a Secondary School Teaching Certification from the Harvard Graduate School of Education. Despite lacking the ability to breathe fire except in the strictly metaphorical sense, Tilia has taught middle school, high school, and college. 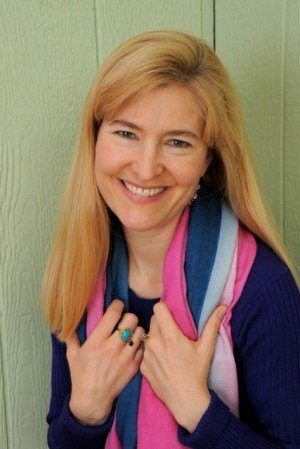 She has also won numerous awards for her fiction and nonfiction writing. She is a judge in the Soul-Making Keats Literary Competition, and she teaches writing in two prisons in Massachusetts. Tilia lives near Boston with her husband, two children, and two standard poodles. Excellent post! Thank you for sharing and for the inspiration. This is so terrific..I am still laughing. Tilia, you are SUCH a good writer. And I love your brain.